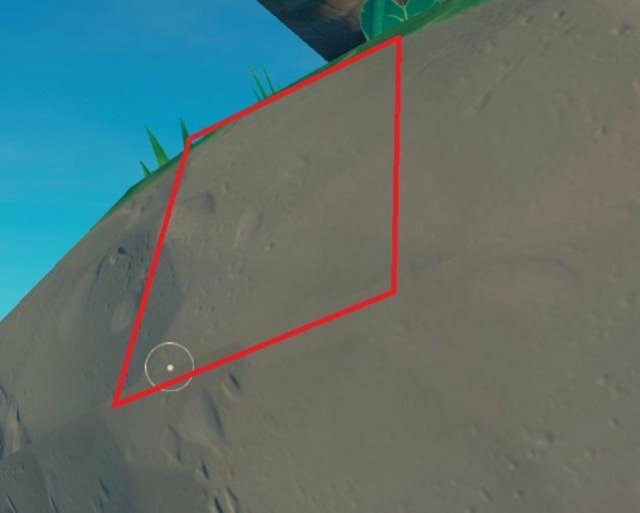 How to access the island tiers with as little building as possible. Starting out on this, I passed by several islands as I was not ready to start diving into the water. Later I did the best I could to strip each island bare before moving on and realized how many resources I had passed up. 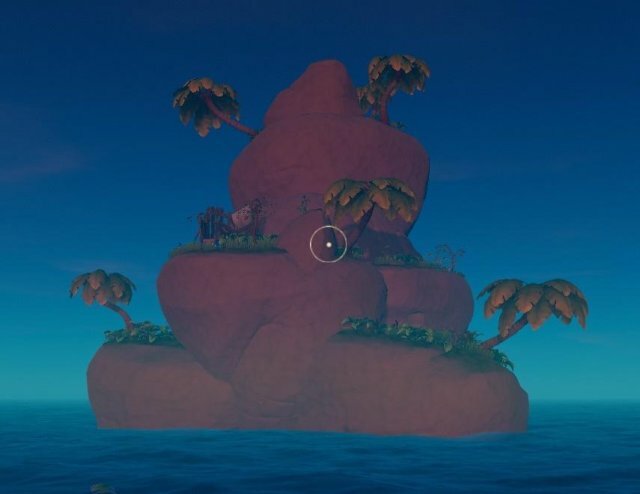 Keeping in mind that a beginning player on their first 5 days is not going to have resources to build a giant staircase to the sky, I wanted to provide a way of seeing islands differently. As a source of easy wood and food for the early game. 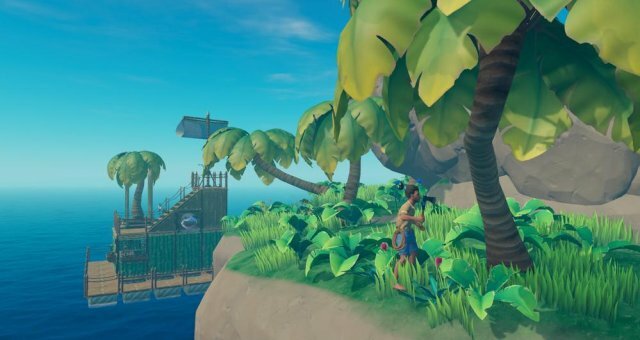 As this game is in Early Access and everything mentioned may be made obsolete tomorrow, this guide will NOT show you each potential route up each island. Instead it will illustrate the types of terrain and the ways you can use the terrain to your advantage. With a little attention you can use these tips to reach most of the islands upper layers (though not always the upper-most ones). This guide does not give hints as to where to find the stockpiles of parts, copper, iron, stone, sand, clay, or underwater "bases" (aside from to say they are IN the water). That said, into the jumping. When you see the islands, there are many types (and hopefully more on the way). 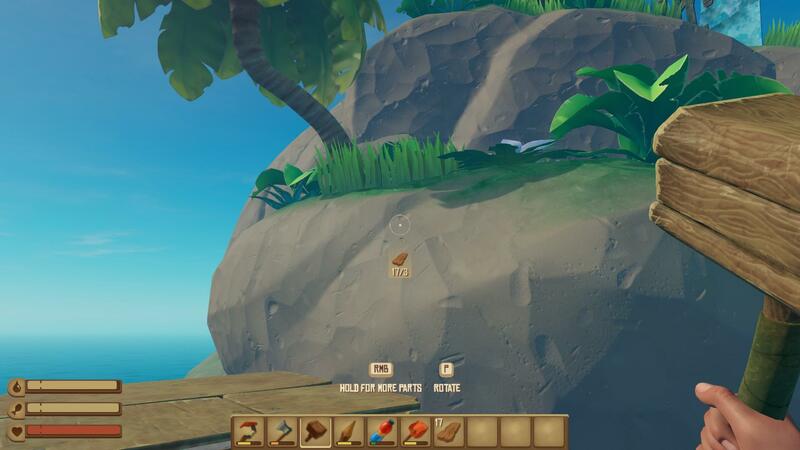 The goal (as I see it) is to get as much loot with as little resource expenditure, you'll want to steer your raft toward one of the lower outcroppings. Hopefully one with a rock and/or tree visible near the second level up. Once you've spotted a likely place, get in closer. Oars are fairly cheap and even basic anchors can be fairly easily replaced. Get right up under (or against) your scramble point. Don't forget to anchor your raft, and empty your inventory (keep an axe with good durability left). Most of the islands you will see have almost nothing at Foundation height (perhaps one palm tree). 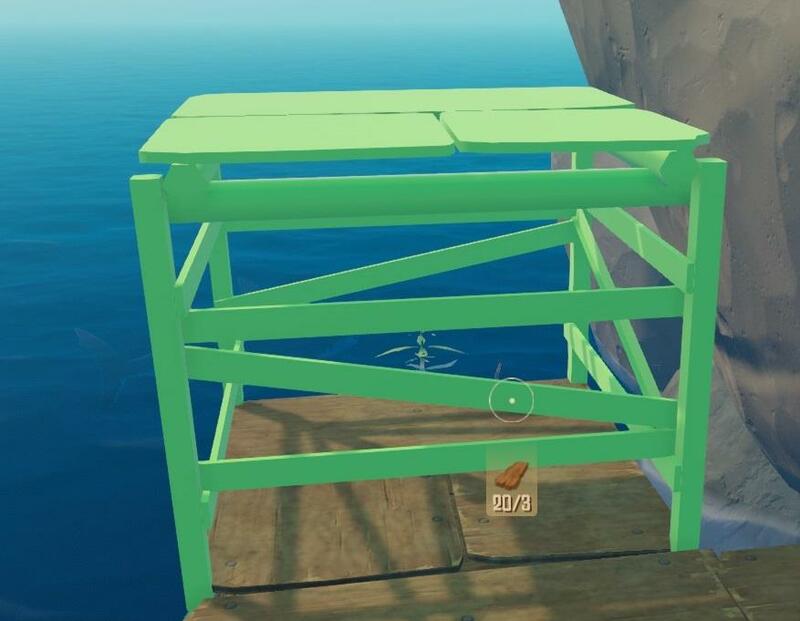 So you will need at least one raised foundation (3 planks). You may need to Stack these to build a hopping staircase onto the rock. (or build a staircase if you want to use a nail). If you are still a bit short, and are low on planks (or are up for a challenge) get a head-start on testing your jumping skills. Keep an eye out for the protruding angles and do your best to jump onto them. Keep in mind, jump at the high point of the swell for best results. 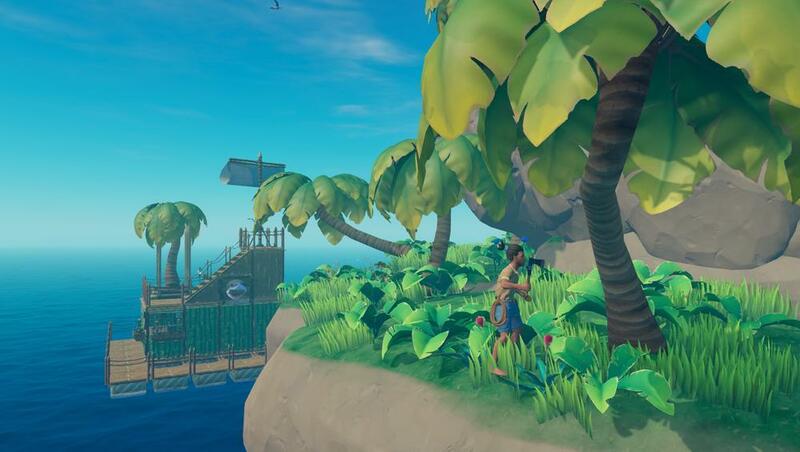 Once you've made it to the island, look around. Every rock or tree could be your ticket higher so don't go all axe crazy until you're sure you don't need that tree for a stepping stone! So, you've figured out where to go, but it's just a cliff wall, or the rock is too high, and doesn't have any protruding angles low enough to jump on. You may have to head back to your raft and build a sky scrapper of junk and waste an anchor (if you're not at tier 2 yet). Or, you could look to the trees! 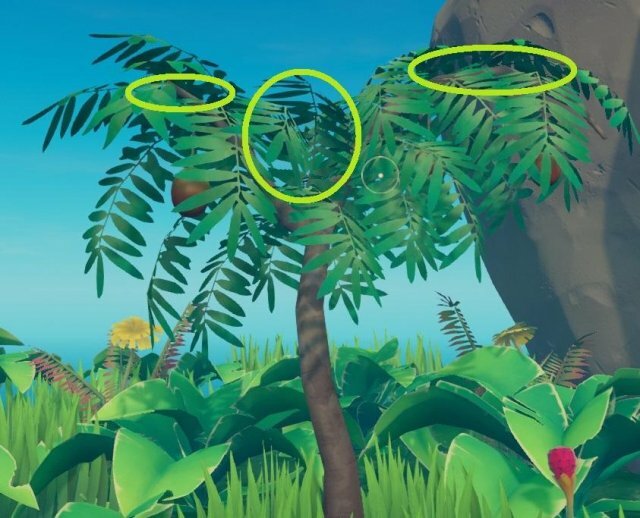 Nearly all of the trees are climbable. Nearly. (The palm tree you grow on the ship and its identical cousin growing on the islands is not (unless you jump on it's top from above, but we need altitude). It can be a bit annoying finding just the right bit of the tree to stand on (and good luck running and jumping), but getting into the trees quite often will let you get to a higher (and rounder aka walkable) section of rock. 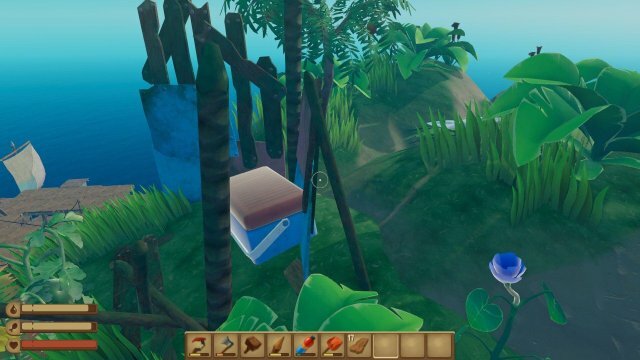 Unfortunately, if you want to reach the highest heights, you'll need to construct a scrap tower, but so far I have been able to climb to the "Box Level" of each island from the second level of my raft with only a raised floor to boost me. 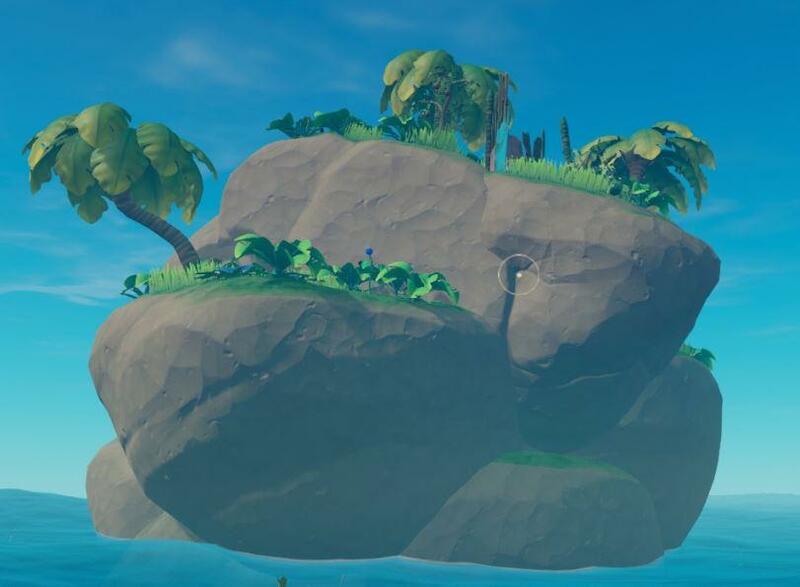 Nor upon exploring the "roof" of these large islands have I found any boxes (occasional flowers and food) save on one island type. So get out there, get hopping, and get those glorious leaves, planks, flowers, and tasty fruits.... and loot boxes, of course (You did empty your inventory before going to all that work right?). Oh! and don't forget to chop your handy stepping stones down once you're sure you've gotten all you need.